Kate Douglas Wiggin (nee Smith) was born in Philadelphia, Pennsylvania on September 28th, 1856. She was raised in Maine. She received her education through home study, district school, Gorham Female Seminary, the Morison academy, and the Abbott Academy. In the 1873 Wiggin moved with her family to California and in 1877, after the death of her stepfather, Kate became involved in the "free kindergarten" movement after attending a kindergarten training class at the Pacific Model Training School for Kindergartners. She opened the first free kindergarten in California, Silver Street Free Kindergarten, and worked there until the late 1880's. Kate wrote and privately published her first book, The Birds' Christmas Carol, in order to raise money for her school in San Francisco. The book helped Kate begin her career in publishing, translation, and travel. Her first husband, Samuel B. Wiggin, a lawyer, died in 1889. 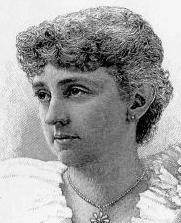 She then alternated her time between New York and Maine and in 1895 married George Riggs. Wiggin was a prolific writer of children's fiction and is best known for Rebecca of Sunnybrook Farm (1903), the story of ten-year-old Rebecca Rowena Randall, a girl with a mind of her own, who is taken in by her Aunts Miranda and Jane. The story was later made into a film starring Shirley Temple. Other works include The Diary of a Goose Girl, Rose O' the River, The Flag-Raising, The Old Peabody Pew, and books of the Penelope series, including Penelope's English Experiences, Penelope's Experiences in Scotland, Penelope's Irish Experiences, and Penelope's Postscripts. In 1904, Bowdoin College presented Wiggin with an honorary degree, only the second such degree the College had ever granted to a woman. Soon after, she founded the Society of Bowdoin Women, a social and fundraising organization. Rebecca Randall leaves Sunnybrook Farm to go and live with her aunts, Miranda and Jane.